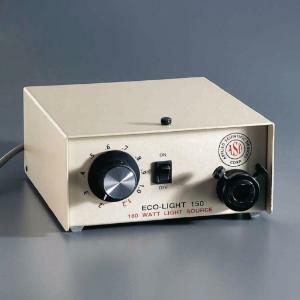 For the greatest-intensity illumination available, choose our powerful 150-watt halogen power supply. Attach one of the light guides, below, for precisely directed illumination exactly where you need it. The power supply is simple to use because the light guide plugs into the front of the unit, and can be moved from one location to another easily, making it ideal for microvideo work. It features an all-metal housing with an on/off switch and light intensity control. Instructions are included, 120 VAC with a 5' 2" three-wire cord. Size: 81/4"L x 71/2"W x 33/4"H.
This light guide, which plugs into the Fiber-Optic Illuminator, allows you to direct two light beams at different parts of your subject. Each light source is contained in a flexible metal conduit that holds its shape when positioned. It comes with a plastic cover. Size: 20"L.
Ideal for microvideo work, simply plug the Ring Light into the Fiber-Optic Illuminator for a bright, even circle of intense halogen illumination to light an object on all sides. It attaches to a stereomicroscope with three nylon bolts that won’t harm surfaces and fits turrets 13/4–21/2" dia. Size: 31/4" dia. ; light guide 25"L.